Everyone in the world uses smartphone apps. But inside them lurks unknown creatures called "Appli Monsters," or "Appmon." The Appmon are AI lifeforms with the ability to think and act, and exist in the boundary between the human world and digital space to allow people and the system to interface and function. But in the vast sea of the internet, the "last boss AI" Leviathan takes control of the Appmon with a virus and begins hacking every system, thus starting to control the human world from the world of the net. 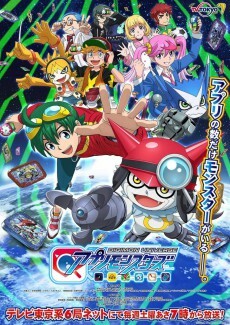 The protagonist, Haru Shinkai, is led to acquire the Appli Drive, and uses it to materialize Gatchmon, a search app monster. What is the secret hidden within the Appli Drive? What is the mysterious field that exists between net world where the Appmon exist, and the real world? What is the "App Combine" that can combine two Appmons? What is Leviathan's true goal?